Semir Sarajlic is a Research Scientist and a Team Lead for Outreach and Faculty Interaction at Georgia Tech’s PACE. Semir obtained his B.S and M.S. degrees in Geology/Geoscience along with a Graduate Certificate in Geographic Information Science (GIS) from Georgia State University. After graduating in 2013, Semir worked at GSU’s IIT and later Research Solutions, where he in research computing and analytics roles provided support for the campus research computing community and research administration. 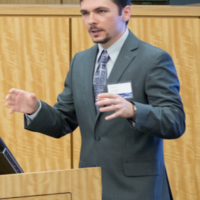 Semir is a co-founder and former PI and Chair of the Scientific Computing Day symposium (http://scd.gsu.edu), and former Co-Principal Investigator on an NSF CyberTraining collaborative research project. He is a member of the XSEDE User Requirements Evaluation and Prioritization group, an XSEDE Campus Champion, and an FY2018 XSEDE Campus Champion Fellow. Semir holds a GISP (Certified GIS Professional) certificate from the GIS Certification Institute, and he obtained certificates in Grant Writing and Big Data Analytics from Emory University.